Today I will break the number one rule, all homilists are instructed never to break. I will speak about what is going on in my personal life, (but don’t worry, It is for a good cause). As many of you know by now, in less than a week, Deacon Cliff and I will be leaving on a pilgrimage to the tomb of the Apostle St James in the city of Santiago de Compostela, in Northern Spain. As pilgrimages go this is NOT your average trip. 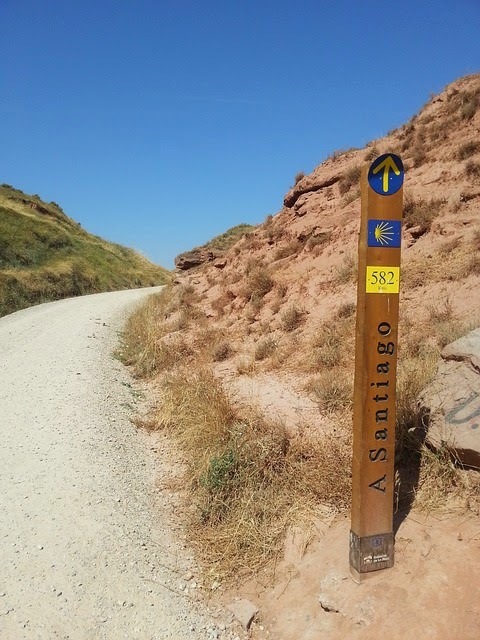 The day after we arrive in Spain we will take a 5 hour bus trip to the Shrine of “La Virgen del Camino”, Our lady of “The Way” there we will pray and ask for her protection as we start our 300 Km (186 mile) walk culminating in the Cathedral of Santiago de Compostela, God willing, 17 days later. We will carry our “Pilgrims Passport” which will allow us to stay in pilgrims “alberges” (low budget Hostels ran by Churches or volunteers), it will also allow us to eat from the “Pilgrims menu” in the alberges, which are the Camino version of soup kitchens. We will share living quarters with dozens of other pilgrims every night and we will sleep in our sleeping bags, wherever they can find space for us. We will carry all of our belongings in our backs, and hopefully we will be able to take a shower every day (Although this is not a 100 assurance). Our lives will be reduced to its bare minimum since the more we pack the more we have to carry in our backs. Every day we plan to pray the liturgy of the hours in community with each other, the angelus, and will try to attend mass in the churches and shrines we will encounter in our way. All this time we will be praying for our families and for you our, St Michael family, and if you have a specific intention you would like us to take to the tomb of the Apostle just drop Cliff or me an email and we will take it with us. Now, you might be wandering why would a couple of middle aged guys like Deacon Cliff and I, will put ourselves through the rigors of a trip which seems to be designed for men half our age. Well, I would not like to speak for Cliff but on my part I find that the words of today’s first reading explain my desire to engage in this trip quite well: “It becomes like fire burning in my heart, imprisoned in my bones, I grow weary holding it in, and I cannot endure it”. In my mind these words of the prophet Jeremiah describes not only my own desire, but the yearnings of all those who have decided to abandon comfort and convenience leaving behind family and friends and follow the Lord. Now, when we hear talk about our own personal crosses we tend to think of people who are struggling in life, who are sick in hospitals, who are persecuted for their faith or who are suffering with the loss of a loved one. We do not associate those words with the high middle class life we live here in the “4 county” area. But if we read Jesus’ words very carefully, the cross is not reserved to those who suffer. The only requirement needed to embrace our crosses is the desire to follow him. If you are like me you are accustomed to have everything at the tip of our hands, our lives are full of resources, convenience and comfort. Now I’m not saying that these things are bad; in fact I view them as a great gift and blessing from God, but unlike those who are forced to embrace their cross through suffering, we have to make a conscientious effort, and act of the will if you may, to take our crosses. And what would the cross be for us? The volunteer abandonment of conveniences and comfort; This is not easy! This is a struggle; the temptation to get back to our easy lives is great! Just try to spend a day of “the grid” without any social media, or communications or computers and you will know what I’m talking about! In the Catholic Church we have a long history of spiritual discipline, of denying ourselves with prayer, fasting, and giving alms, even works of mercy like visiting the sick and consoling the suffering, could become part of embracing our crosses, if they get us out of our comfort zone and cost us an extra effort. It is easy to say that we want to follow the Lord, but when “push comes to shove”, are we ready to do what the Lord expects us to do? Are we up to the challenge? Think and pray about it, and also pray for Cliff and I so that we have a safe and spiritually rewarding trip. God bless you all.